Estimated In Stock date is 5/10/2019. The Universal Security Instruments Hardwired MIC1509S 3-in-1 Smoke, Fire and Carbon Monoxide Smart Alarm provides 10 years of continuous protection against three deadly threats within the home. New patented Universal Smoke Sensing Technology offers the benefits of both photoelectric and ionization alarms in one device to protect against fast flaming and slow smoldering fires. 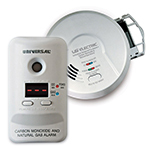 This detector also features protection against the silent killer - carbon monoxide - making it a 3-in-1 device. The ideal addition for new or replacement installations, this maintenance-free alarm is suitable for houses, apartments and mobile homes in every room. This USI Alarm conforms to UL217 and UL2034 standards. It is also California State Fire Marshal approved and Federal Housing Authority (FHA) approved to exceed industry standards. 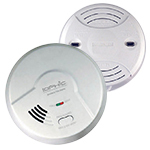 The Universal Security Instruments MIC1509S 3-in-1 Smoke, Fire and Carbon Monoxide Smart Alarm comes with a 10-year limited warranty that covers both the battery and alarm. I needed to buy new ones, the old ones were 10 year old. They work exceptionally well. Removed old detector and plugged new one in. Exactly what I was looking for! Great company to work with! Replaced all 7 outdated smoke alarms with this USI 3-in-1 and am very happy. It was very easy to install and only had to change out the base and wiring on 3 of them. Received the products ordered was able to install both in about twenty minutes, insured that they sync with the other five and the job was complete. Will order more when the time comes again. The sealed 10 year battery was a selling point for us in addition to the breadth of protection. No more chirping or climbing the ladder. Great support from on line and store reps to choose the right units. Easy to install. Makes me feel safer knowing I have co detectors. NO PROBLEMS INSTALLING THIS UPDATED MODEL OF MY OLDER ALARM. THE EXISTING WIRING PLUGGED INTO THE MIC 1509S EASILY. We did not have a co detector downstairs and our upstairs one had reached its life limit so we added a hardwired co and they work great! Thanks for great service and product. Replaced a 14 yr old Smoke, Fire, Carbon Monoxide Alarm. Great that the new Smart Alarm has sealed backup battery. No more replacing batteries...Yeah. Product came on time and in good working order. Electrician had some difficulty installing them, but was able to work it out. Good value. Received the alarm, pulled the tab. Pulled the old ring from the ceiling and replaced it with the new ring. Installed the alarm, plugged it in and done! Order processing was straight forward. Selected the type of detector I wanted and submit my payment. Detector arrived ahead of schedule. Installation took all of 5-mins and detector was up and running. Good but is there a model with a battery as well as electrical connection? It seems sufficient, but I'd prefer a model that can use a back-up battery in case of a power outage. So far so good. No chirping! Am happy! Great product. Easy to install. Fast shipping. I love these 3-in-1 detectors. With no batteries to change and backwards compatibility built-in with their previous models you can't go wrong! In just a matter of 20 minutes I was able to replace all of my older sensors 4 with the new 3 in 1 model. A quick change of the mounting plate and a pull on the battery tape and all was good to go. I bought two of these items and I already installed them in my basement. So far, they haven't been misbehaving. I ordered from USI after not being able to find the device I wanted on other sites bad filters, incomplete descriptions. Even USI lacked some information, so I contacted customer service and received prompt and clear answers to my questions. I ultimately ordered 6 devices which we were able to install ourselves. It was difficult to find a dual sensing alarm with CO and sealed battery. Glad I found this company. Great product. Easy to install. Easy installation and excellent quality. I can't say enough good things about USI products. Their customer service was very knowledgeable and quickly responded to my questions. 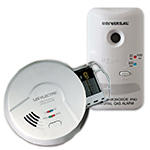 When one of my smoke & co2 detectors needed to be replaced, I went online on the USI website. The model I had was no longer available. So I called and got help. I was given 3 choices for a replacement. I chose this one for the 10-year sealed battery. It's really annoying when those batteries go and the unit starts chirping. So far, I am very pleased. Replaced 2 older USI smoke detectors with 2 of these units. Simple installation and great that they have a sealed 10 year backup battery! Very nice to have 3-1 detectors connected to the other units throughout the house! Excellent product! Covers all 3 threats and is easy to install! It's like, you got to lose to win. Or is it the other way around. My daughter bought her first townhouse. It had 5 USI 1204 units which were engraved that their lifetime expired in 1999. Well no sense in replacing the batteries. So I ordered a 5 unit box of the MIC1509S. They went in very easy didn't have to do any major surgery. Now do I have to wait for a fire or a CO event to rate these. Sorta hope that it doesn't come to this. This was as easy as it gets. The new units plugged directly into the existing wiring. The only piece I had to change was the plate as the dog ears are different with the new units. Will be buying some other replacements for smoke detectors. I replaced six USI 5304s with the 1509s. It was easy and gave our home protection against carbon monoxide in addition to smoke and fire. During the install of the sixth detector, the battery pull tab broke. Customer service shipped out a replacement immediately and made the return of the broken product convenient. Im very pleased with the product and USI support! No problems! Easy to mount and works fine. Purchased this detector to replace the old bedroom hallway unit. Way more comfortable with the three in one design this detector has for the sleeping level of our home. The 10 year battery makes this a install and forget instrument. Just need to hit the test button on occasion. Local electrician quickly and easily replaced the existing 30-yr old interconnected detectors with the USI 3-in-1 detectors. Appearance of installation is very neat. Easy to install, great products, like the 10 year battery.